Pirin is among the most beautiful of Bulgarian mountains. Its raw beauty has won the hearts of not only passionate mountaineers but also regular tourists. Its inaccessible slopes and breathtaking views are a tempting challenge for all fans of mountain tourism. 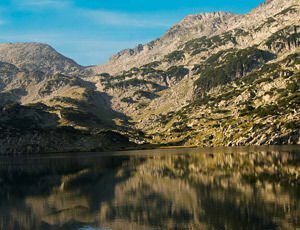 Pirin mountain's greatest treasures is its lakes, all 186 of them. Pirin's lakes have glacial origins. They are spread out along granite cirque glaciers of varying size and are distinguishable by their great depth and clear water. The water in some of these lakes is ice-cold, which is no surprise considering the high altitude. But in some lakes, such as the Bansko lakes, it's even suitable for bathing. Popovo Lake is part of a group of lakes called the Popovo Lakes in Pirin. It has the largest area and is the deepest lake in Pirin. It sits at an altitude of 7327 ft (2234 m) above seal level and remains a favorite among tourists. Popovo Lake, like the rest of the lakes in the group, is situated at the bottom of the Popovo Lake Cirque in Pirin. The cirque itself is the largest in the mountain - 6 km long and 3 km wide. It is in essence a deep depression, surrounded by the nearby slopes. The lakes formed at the bottom of the cirque when the glaciers melted. Even though Popovo Lake is the largest lake in Pirin, it only ranks 4th in size among Bulgaria's lakes, coming in after Smradlivo Lake, Gorno Ribno Lake and Bliznaka in Rila. Popovo Lake has a surface area of 123 600 m². Its max depth is 96.8 ft (29.5 m), making it the deepest among the Popovo Lakes and 2nd among all Bulgarian lakes, right after The Eye lake. The water in the lake collects primarily from the 2 little nearby springs and rainfall. When the snow cover of the nearby peaks Dzhengal, Momin Dvor, Dzano, Kralev Dvor and Syvria begins to melt at the end of spring, the lake reaches its maximum volume of 1 270 000 m³. The waters of Popovo Lake flow into the Ribni Popovo Lakes, which are located below it, in a terrace-like arrangement and mark the beginning of the Retije River. Until the year 1942, Popovo Lake bore the name "Papazgyol", meaning Popovo Lake in Turkish. The name of the lake is linked to 2 legends. According to the 1st, during the Ottoman Rule, a daughter of a priest was kidnapped by the Turks and raped. The father, unable to live with the violation of his beloved child, threw himself in the icy waters of the lake. Only his kalimavkion (clerical hat) floated up to the surface, which formed the island in the middle of the lake. The other legend states that after the Christianization of the Bulgarians, a self-confident priest went in search of the Proto-Bulgarian god Perun to drive him away. The priest found the god Perun, who was absolutely furious with him and as punishment threw the priest into the lake.